If you have ever wondered how the Oscar Mayer “Wienermobile” handles, just ask John “Jumbo Dog” Craft. “It handles like a Lambo-weenie,” said Craft, a brand representative for Oscar Mayer, the American meat production company. 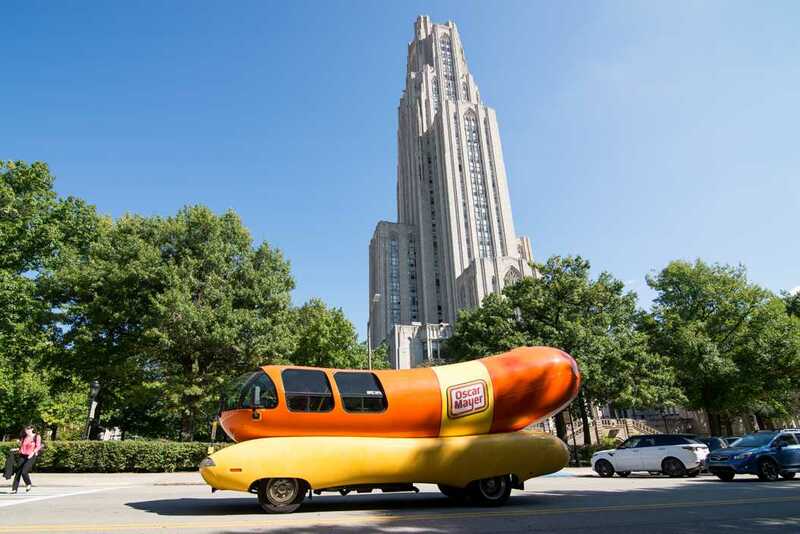 Wednesday morning, the Oscar Mayer “Wienermobile” rolled into the William Pitt Union driveway as part of the career fair, scoping out top Pitt talent. A pair of enthusiastic brand representatives, called “Hot Doggers,” bore tidings of “weenie whistles” — Wienermobile-shaped whistles — as well as cardboard cutouts for photo-ops and information on career opportunities. Career Fair is typically a time for personable, high-achieving Pitt students to make an impression upon recruiters, conveniently concentrated within the confines of the student union. While the event often means stiff blazers, firm handshakes and resumés printed on cardstock, Oscar Mayer offers a more lighthearted alternative. “Say ‘cheesy weenies,'” said Craft, as a trio of college students posed with cardboard hot dog cutouts in front of the Wienermobile. Craft, 24, and his “weenie wife,” Jackie “Jalapeño” Stumm, 22, oversaw the operation of the 27-foot-long steel sausage. The machine, resembling a crossbreed between billboard and ice-cream truck, fashioned the classic Oscar Mayer emblem and blasted the unmistakable “Oh, I Wish” theme song — the oldest running jingle in advertising. “[My generation] grew up with that — ‘Oh, I wish I was an Oscar Mayer weiner,’” sang registrar employee David Geragi, 57, who was offered a tour of the vehicle’s interior. Like the wiener version of a private jet, the Wienermobile’s upward-swinging doorway revealed a big screen TV, six standalone seats and a massive sound system, as well as an intercom. “Everybody put on your ‘meat belt,’” said Craft, as students poured in and out of the Wienermobile. With Pitt students on the prowl for jobs, being a ‘“hot-dogger” may be a wild ride they don’t want to miss. To see more photos from the Wienermobile’s adventure at Pitt, click the first photo to open up a captioned slide show.